VT Fish &Wildlife cautions drivers that moose are more likely to be crossing roadways at this time of year, especially after dark or early in the morning as they move from wintering areas to spring feeding locations. Drivers need to be alert and cautious because moose are on the move, according to the Vermont Fish & Wildlife Department. Moose are more likely to be crossing roadways at this time of year, especially after dark or early in the morning as they move from wintering areas to spring feeding locations. Always be aware of the danger—moose cross the road randomly, as well as at habitual crossing places. Increase your roadside awareness and reduce your speed when you see “Moose Crossing” signs along the highway. When on secondary roads, the recommended speed is 40 mph or less in these areas. If you see a moose ahead, slow down or stop. Trying to speed past them “before they can move” can be a serious mistake. Rt. 12 from Worcester to Elmore. Rt 118 near Belvidere Corners and the Rt. 109 intersection. Nineteen people have died in motor vehicle collisions with moose on Vermont highways since 1985. The crash usually kills the moose as well. 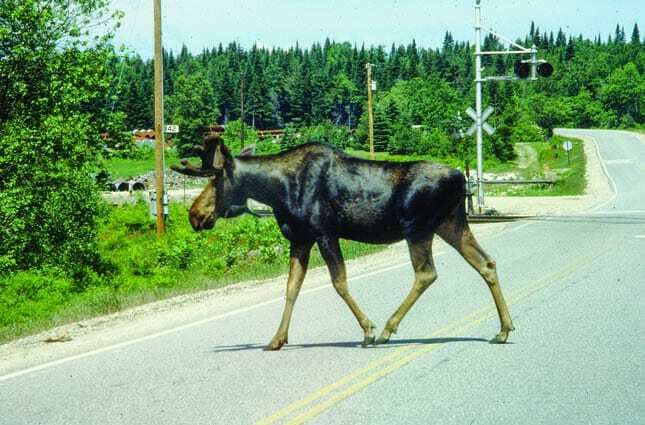 Editor’s note: Moose have been particularly seen along the following local roads in higher terrain: Rte 4, Killington; Rte 73, Goshen/Rochester; Rte 12, Barnard; Rte 100 between Granville and Warren. Moose country includes high mountain wetlands and forest. Remain alert passing through these areas.